This collection, depicting the grim realities of the four-year struggle for the Ypres salient, showcases the work of the contemporary combat artists and illustrators from the Great War era. Included here are the works of serious artists, propagandists, illustrators and humorists. The result is a vivid graphic record of life and death in the most infamous campaign of the Great War, as reported to contemporary audiences at a time when the events of the Great War were still unfolding. During the Great War artists and illustrators produced a highly accurate visual record of the fleeting moments the bulky cameras couldn’t reproduce. These works form a body of war reportage that are as valid as the written word. 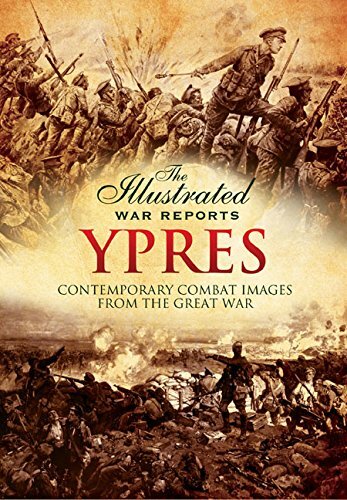 Today, the work of the combat illustrators and the official war artists from the Great War era is overlooked by historians in favour of photographs, but these illustrations are nonetheless important, as they provide a contemporary record.